On 26th April 2012 the ’08 Tapestry went on public display at the Liverpool Life Museum,Pier Head,Liverpool Waterfront,Liverpool,L3 1DG. The Tapestry was created by more than 150 Liverpool people to celebrate the City’s Capital Of Culture year 2008. The Liverpool Tapestry: People, Places and Passions is on view in the museum’s Skylight Gallery until 16th September 2012. The tapestry is sponsored by HomeBargains, and each of the 338 individual tapestry panels which make up the triptych was hand-stitched, and the artwork is more than 18ft ( 6m ) long. The panels feature Superlambananas, the City’s historic buildings and aspects of Liverpool, which together form a snapshot of the city in 2008. 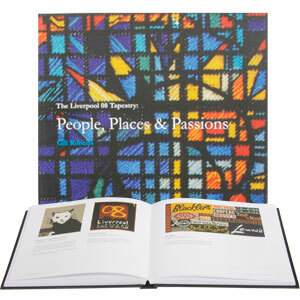 The book of the Liverpool ’08 Tapestry, People, Places and Passions by Gill Roberts is now available and has been distributed free by HomeBargains to everyone who contributed a piece to the Tapestry. If you would like to buy a copy the book is available in St Georges Hall, St George’s Pl, Liverpool, L1 1JJ costing £10, or visit http://www.liverpool08tapestry.co.uk/ where you can view the book and order a hardback copy for £10 + £2.99 p&p.